Interesting form of dwarf Willow.Foliage is brightly variegated pink,white and green.Height to 2 metres. Dense,upright habit,glossy lanceolate evergreen foliage. The sweet-smelling white flowers open from February and crowd the branches during early spring. Suitable for a shady position. Deciduous tree having dark green leaves that turn yellow to orange and red in autumn. The rose-like open white flowers with creamy yellow stamens are borne in midsummer. Delightful tree having a mass of white ,scented flowers in late Spring to early Summer. Good Autumn foliage colour too. A very attractive dwarf 'Lilac' that has a profusion of mauve panicles of flower in May and June with a good scent. Height and spread of 90-120 cms. Often known as 'Evergreen Jasmine' this climbing plant has dense,glossy green foliage and a profusion of scented,starry white flowers over a long period in summer. 'Flame Nasturtium'. Scrambling plant best suited to growing through shrubs in a shady spot with moist,acid soil. The bright red flowers appear in profusion in summer and last into autumn. 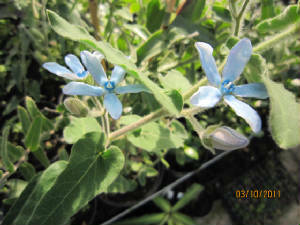 A lovely shrub from South America, the unique, vivid,powder-blue to turquoise flowers are borne throughout the growing season. Not very frost hardy but can be grown outside perhaps by a sheltered wall. 'Chilean Guava'- Lovely evergreen shrub for a sheltered position near a wall or perhaps in a courtyard situation. The small pink/wite bell flowers are followed by bright pink,round edible fruit through late summer and autumn. Strong upright growth,fragrant pink flowers show well on bare stems during the winter. Height 2--3 metres. Deciduous shrub of quite neat,rounded habit to around two metres in height and spread. The flowers,rich pink in bud,open pure white and have a fantastic fragrance which fills the air in April and May. Good Autumn foliage colour too. Similar in many respects to Viburnum carlesii 'Aurora' but differs in that the flower bud is quite dark pink and the flower retains some pink when open. Fabulous scent. Evergreen or semi-evergreen shrub with large,glossy green,long lanceolate leaves,the new growth having a bronze tinge. The white flowers are produced in a profusion of rounded heads in June and July. Strong in growth but remains reasonably compact to 2 metres. Deciduous shrub,the large,rounded heads of flower are pink in bud opening white and are heavily scented. Flowering April/May. Bright red/orange Autumn foliage colour. Height to 2 metres. A really good shrub for colour and interest,the large oval leaves are glossy green and turn brilliantly to reds,oranges and purples in the Autumn. The rounded heads of white flowers appear in May June and are followed by heavy clusters of pink berries. 'Japanese Snowball Bush'. Spreading,bushy deciduous shrub with large,deeply veined leaves that turn red-purple in autumn. Bears spherical heads of white flowers in spring. Deciduous shrub having foliage variegated cream and green. The tubular pink flowers are produced first in May/June and often repeat later in the season. Height to 2 metres.